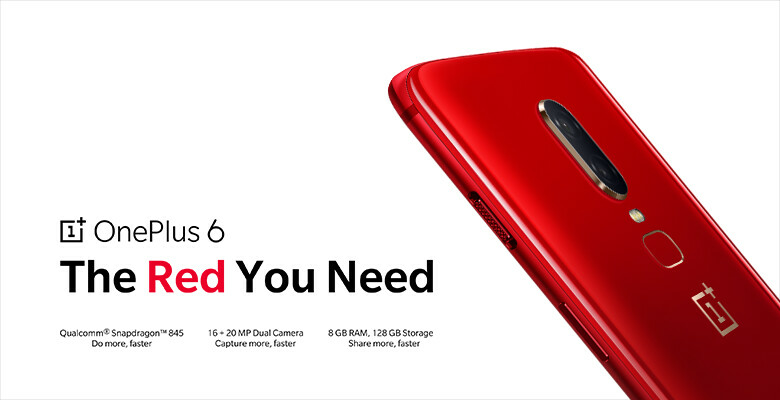 OnePlus just announced a new, flaming red version of its latest high-end champ, the OnePlus 6. Succeeding the Lava Red OnePlus 5T from last year, the new color version of the flagship device will be available in all markets where OnePlus usually does business. Simply dubbed OnePlus 6 Red, the new color version of the handset wouldn't be a limited edition similar to the the Lava Red OnePlus 5T, or at least OnePlus doesn't explicitly say so. If anything, the company seems keen on making the flamboyant color a regular option for future would-be OnePlus consumers. The company admits it has historically been a bit restrained when it comes to diversifying its color portfolio, mostly launching devices in black and white, but no more. "To us, red exudes enthusiasm and personality. It also represents an inner confidence and courage. There is a kind of power in red, which the OnePlus logo has always tried to articulate. We hope you feel similarly empowered when you hold the OnePlus 6 Red this summer." As usual, a new color finish revealed a new set of technical challenges that the company had to tackle. When it comes to the fiery color, it's easy to go overboard and oversaturate things, but OnePlus restrained itself and toned-down things in order to achieve a classier, amber-like finish. "In order to achieve an “amber-like” depth and clarity, we used a new film coating process that’s never been attempted before in the smartphone industry. The result is a red that’s more elegant, one that leaves a strong impression of quality and value." The red OnePlus 6 will be available with 8GB of RAM and 128GB of storage and will cost as much as the Midnight Black and Silk White versions of the phone that came in the same configuration - $579 / EUR569. As we said, you will be able to get the red OnePlus in all regions where the company sells it wares. To put things in perspective, the 6GB/64GB Mirror Black version of the phone sells for $529, while the 8GB/256GB version retails for $629. The device will be available starting early next week. This is the kind of variant I wish they would put out first. Yeah, the same was seen in second leaked hands on pic.